Second in a series of four ruins we're creating. Larger and more complicated than the first, as we're now a little more confident in our molding and casting process. I don't think we'll be making a prototype mold of this one. 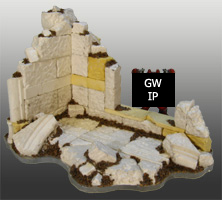 we're going to roll the dice with the Kickstarter concept, and see if we can send the whole set of Domus Ruins off to get the real production molds created. That would be fantastic!